Below is a Criminal Conviction Information Q&A from the Contractors State License Board. *Business and Professions Code sections 144 and 7069, and California Code of Regulations sections 869.1, 869.2, 869.3, 869.4, and 869.5. Q. Who must be fingerprinted? A. All applicants for license and each officer, partner, owner, and responsible managing employee, as well as home improvement salesperson applicants, must be fingerprinted. Individuals currently licensed by CSLB who do not apply for any changes to their license and applicants for a joint venture license are not required to be fingerprinted. Q. How do I get fingerprinted? A. After an application has been accepted by CSLB as complete (also known as “posted”), each individual listed on the application is sent instructions on the process for obtaining and submitting fingerprints and a “Request for Live Scan Service” (form BCII 8016). You must complete the third section (applicant information) in its entirety and take three copies of the completed form to a Live Scan station to have your fingerprints processed and submitted to DOJ and FBI. 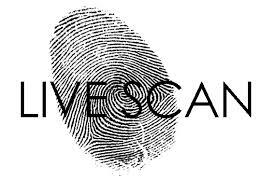 Live Scan fingerprinting services are available at most local police and sheriff departments, and any public Live Scan site. A listing of Live Scan locations is available at: http://caag.state.ca.us/fingerprints/publications/contact.htm. Please see information below for out-of-state applicants who must submit hard copy fingerprints. Q. What do I do with the three copies of the Request for Live Scan Service forms after being fingerprinted? A. The first copy of the form will be retained by the Live Scan operator. You should retain the second copy of the form for your records. You must submit the third copy of the form to CSLB within 90 days after you receive the packet that contained the Request for Live Scan Service form. Failure to do so may result in your application being voided. Q. Is there a cost for fingerprinting? A. Yes, you are required to pay the Live Scan operator the $32 DOJ fingerprint processing fee and the $19 FBI fingerprint processing fee, as well as the Live Scan “rolling” fee. NOTE: The rolling fees vary because each Live Scan location sets its own fee—CSLB does not set the price. The listing of Live Scan locations includes information about the rolling fee. Q. What if I’m located outside of California or do not have access to a Live Scan facility? A. If you do not live in California and do not plan to come to California during the application process, or if you do not have access to a Live Scan site, you will be fingerprinted using hard copy fingerprint cards. For out-of-state residents, the hard copy cards automatically will be generated and sent after your application has been posted. For California residents who do not have access to a Live Scan site, you may contact CSLB’s automated telephone system at (800) 321-CSLB (2752) to request hard copy fingerprint cards. When the system answers, press 2-1-4 and provide the requested information. Hard copy fingerprint cards will be sent to you. You must take the cards to a law enforcement agency within the United States to have your rolled fingerprints. Return the cards with the required processing fee of $51 to CSLB for submission to DOJ and FBI. You also may be charged a “rolling” fee by the agency providing the service. Please note that the processing time required for hard copy fingerprint cards is substantially longer than Live Scan fingerprinting, taking three to six months or longer. Q. I have heard about applicants who had their fingerprints rejected or who had “delays” through DOJ or FBI— what does this mean? A. Fingerprint submissions may be rejected if there is a problem with quality of the fingerprint image— whether Live Scan or hard copy cards. Applicants who have had their fingerprints rejected will be asked to make a second attempt at fingerprinting. If there is a second rejection, CSLB will request that DOJ and/or FBI do a name check, which can be a lengthy process. Delays may occur if DOJ and/or FBI are researching an issue, which also can be a lengthy process. The outcome of a delay may be a clear record or a conviction record. Q. What can I do to prevent any unnecessary delays with my application? A. The number one reason that an application may be denied is the applicant’s failure to accurately disclose his/her conviction record. Therefore, checking the application’s “Yes” boxes, when appropriate, and providing the required information regarding each conviction are the most important things that an applicant can do to avoid unnecessary delays. In addition, please respond promptly if contacted by CSLB’s Criminal Background Unit staff. Q. I only have misdemeanor convictions from many years ago—do I need to check the “Yes” box on the application’s conviction question (Question #11)? A. Yes, if you have any conviction of any kind (misdemeanor, felony, etc. ), regardless of the nature of the conviction or when the conviction occurred, you must check the “Yes” box and provide the requested information. A conviction means a plea or verdict of guilty or a conviction following a plea of nolo contendere. Please be aware that if you have any criminal record, all convictions are reported to CSLB, including those that have been sealed, expunged, or reduced under Penal Code section 1203.4 or an applicable code of another state. Failure to disclose all convictions is falsification of the application, which was signed under penalty of perjury, and is grounds for denial. Q. What information/records should I provide with my application if I have a criminal conviction and how should I provide it? A. You must start by checking the “Yes” box for Question #11 (regarding applicants’ convictions) on the application. You are required to attach a statement disclosing all pleas/convictions, including laws violated, and thoroughly explain in your own words the acts or circumstances that resulted in the plea/conviction. In addition, the following must be included for each plea/conviction: date of the plea/conviction, county and state where the violation took place, name of the court, court case number, sentence imposed, jail/prison term served, terms and conditions of parole or probation, parole or probation completion dates, and parole agent/probation officer names and phone numbers.You may submit the required information using the “Disclosure Statement Regarding Criminal Plea/Conviction” form. Applicants also may be asked to provide certified copies of the court records, including the complaint, complete docket, judgment and sentence, and probation reports, if any, for all convictions. You also may be asked to provide copies of police and/or other investigating agency reports, as well as certified copies of decisions from other state or federal agencies, if applicable. Providing these documents will assist CSLB in processing your application as quickly as possible. Q. How can I demonstrate rehabilitation? A. Applicants are given the opportunity to explain any criminal conviction. You may be asked to do this in writing. In addition to providing an explanation, you may provide evidence of rehabilitation such as counseling, gainful employment, completion of an appropriate rehabilitation program, etc. See CCR section 869 for CSLB’s regulation on criteria for rehabilitation at http://www.cslb.ca.gov/About_Us/Library/Laws/Substantial_Relationship_Approved_Text.aspx. Applicants who still are on probation after a conviction, particularly a felony conviction, should be aware that they may experience more difficulty in demonstrating rehabilitation, due, in part, to the limited amount of time that has elapsed since the conviction. Q. What happens if I have a criminal record? A. Just because you have been convicted of a crime does not automatically mean your application will be denied. CSLB’s Criminal Background Unit (CBU) reviews all criminal convictions to determine if the crime is substantially related to the duties, qualifications, and/or functions of a contractor. Since no two conviction records are the same, they are reviewed on a case-by-case basis. The criteria used by CSLB include whether the crime shows the present or potential unfitness of an applicant or licensee to perform the functions authorized by the license in a manner consistent with the public health, safety, or welfare. In addition, CSLB reviews and considers any evidence of rehabilitation submitted by the applicant or licensee. Please see the above link to the California Code of Regulations sections 868 and 869 for more specific information on the criteria for determining substantial relationship and rehabilitation. 3) the application is denied based on the applicant’s criminal conviction history. Q. What kinds of convictions might cause the denial of an application for licensure? A. As stated above, since no two conviction records are the same, CBU reviews conviction records on a case-by-case basis. A single conviction of one type may be cleared on one application, while that same type of conviction may be cause for denial on another application when there are multiple occurrences of the same conviction or when combined with other convictions. The primary factors in the evaluation of conviction records are the nature and severity of the crimes, the amount of time that has elapsed since the conviction, and any rehabilitation that has been demonstrated by the applicant. Convictions may be deemed substantially related to the contracting business for numerous reasons—substantial relationship does not mean solely that the crime must have occurred on a job site or involve financial matters. While those types of convictions may be substantially related, many other convictions may be considered substantially related to the contracting business because they may indicate the present or potential unfitness (in relation to the public health, safety, or welfare) of an applicant to hold a license. Q. What is a probationary license that may be issued pursuant to Business and Professions Code section 7073? A. In some cases, based on the applicant’s criminal record, CBU may offer an applicant the opportunity to be issued a probationary license in lieu of denying the license because of a criminal conviction. The issuance of this probationary license is authorized by subsection (e) of Business and Professions Code section 7073, which states, in part, that in lieu of denying a license, a probationary license may be issued with terms and conditions. It is a fully functioning license that will remain on probationary status for a set period of time—typically two to four years. Q. What are my rights if CSLB denies my application for licensure because of a criminal conviction? A. If CSLB determines that an applicant is not qualified to receive a license at the present time due to prior criminal conviction(s), he/she has the right to request a hearing on the decision. This request must be submitted to CSLB in writing no later than 60 days after the date of the decision to deny. These rights are stated in Chapter 5 (commencing with section 11500) of Part 1 of Division 3 of Title 2 of the Government Code. Failure to request a hearing in a timely manner results in the applicant losing the right to a hearing. Please note that there can be lengthy delays before a hearing is scheduled. As stated above, every criminal record is unique. Only the Contractors State License Board, Criminal Background Unit can make a determination regarding the acceptance or denial of an applicants criminal record. You will need to submit an application and go through the fingerprinting process before they will review your records. If you need additional information, please contact us.